We are blessed at the Fed with sophisticated econometric models and superb analysts. We can easily conjure up plausible theories as to what we will do when it comes to our next tack or eventually reversing course. The truth, however, is that nobody on the committee, nor on our staffs at the Board of Governors and the 12 Banks, really knows what is holding back the economy. Nobody really knows what will work to get the economy back on course. And nobody—in fact, no central bank anywhere on the planet—has the experience of successfully navigating a return home from the place in which we now find ourselves. No central bank—not, at least, the Federal Reserve—has ever been on this cruise before. I would point out to those who reacted with some invective to the committee’s decision, especially those from political corners, that it was the Congress that gave the Fed its dual mandate. That very same Congress is doing nothing to motivate business to expand and put people back to work. Our operating charter calls for us to conduct policy aimed at achieving full employment in addition to preserving price stability. A future Congress might restrict us to a single mandate—like other central banks in the world operate under—focused solely on price stability. But unless or until that is done, we have to deliver on what the American people, as conveyed by their elected representatives, expect of us. The rest here is very much worth a careful read. I’ve been in favor of using monetary policy (if properly done) in the recent past to help with our economic troubles. Fisher gives us something to think about in terms of the limits of monetary policy, the problem of the Fed’s dual mandate, and the need to get our fiscal house in order. 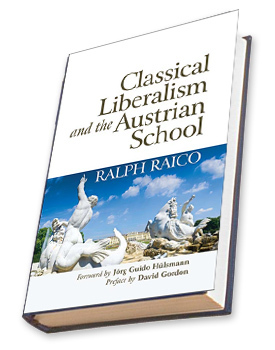 Classical Liberalism and the Austrian School is the latest collection of essays from Ralph Raico, published by the Ludwig von Mises Institute. Ralph was kind enough to send me a print copy. The introductory, eponymous essay concerns the relationship between Austrianism as an economic methodology and classical liberalism as a political program or ideology. Raico disputes Mises’ contention that Austrian methodology (methodological individualism) is clearly separate from the normative claims of classical liberalism (2-3). Raico builds a persuasive case that Austrianism as traditionally understood is indeed naturally related to classical liberalism; however, I would argue that this implication is not entirely to the credit of traditional Austrianism. If there is a filter that filters out (destroys) all non-P Q’s, then the explanation of why all Q’s are P’s (fit the pattern P) will refer to this filter. For each particular Q, there may be an explanation for why it is P, how it came to be P, what maintains it as P. But the explanation of why all Q’s are P will not be the conjunction of these individual explanations, even though these are all the Q’s there are, for that is part of what is to be explained… The methodological individualist position requires that there be no basic (unreduced) social filtering processes. The filtering process for the firm is profit maximization. We can know that firms try to maximize profit even if we do not have a good explanation for why each individual firm tries to maximize profit, or why individuals have chosen so to organize themselves. The answers to the latter question were developed by Coase and Williamson, by the way (Chicagoites, not Austrians, though fully taken on board by contemporary Austrians). Although labor unions have been celebrated in folk songs and stories as fearless champions of the downtrodden working man, this is not how economists see them. Economists who study unions—including some who are avowedly prounion—analyze them as cartels that raise wages above competitive levels by restricting the supply of labor to various firms and industries. Many unions have won higher wages and better working conditions for their members. In doing so, however, they have reduced the number of jobs available in unionized companies. That second effect occurs because of the basic law of demand: if unions successfully raise the price of labor, employers will purchase less of it. Thus, unions are a major anticompetitive force in labor markets. Their gains come at the expense of consumers, nonunion workers, the jobless, taxpayers, and owners of corporations. As I’ve noted before, I think people have a right to belong to unions or any other freely chosen associational institution. The problem is when governments give unions special privileges – which they have in abundance at great cost to the rest of us (including lots of “workers”). Pileus has posted a number of pieces on unions over the last year, especially public sector unions. Celebrate May Day by reading some by searching for unions in the box to the right! Here is one particularly interesting series on unions and taxation by Jason Sorens – Part I and Part II. Two of my posts earlier this week (here and here) focussed on the institutional implications of limited rationality. My claim was that robust institutions are those that minimise the consequence of inevitable human errors. In a nutshell, this is the Hayekian argument for the competitive ‘exit’ principle as facilitating a process of evolutionary learning under ‘bounded rationality’. Though this insight has often been recognised in economics (though not as much as one might hope), relatively little has been made of what bounded rationality might imply for questions of distributive or social justice. This is surprising for no less a figure than John Rawls recognised that when choosing distributive rules from behind the ‘veil of ignorance’ people should have access to ‘basic facts of social theory’ to enable them to engage in an impartial choice of just institutions. Impartiality for Rawlsians, of course, equates to support for a ‘basic structure of society’ that institutionalises the ‘difference principle’ (maximise the position of the worst off) and a distributive branch of government – i.e. a welfare state, that distributes resources accordingly. If the ‘basic facts of social theory’ include recognition of limited human rationality and the need for institutions that promote learning, however, then it is worth reconsidering what the requirements for an impartial choice of social institutions might be. More specifically, if the choice of social institutions takes place under bounded rationality or genuine ignorance (save for ‘basic facts of social theory’), then it seems highly unlikely that people would opt with certainty for any particular distributive rule, such as Rawls’ difference principle. If people are genuinely ignorant, not only of their talents and social position, but also about the values and beliefs they will possess, their attitudes to risk and how these are likely to change in the light of experience and mistakes then it seems more plausible to suggest that they might opt for a ‘basic structure’ that would enable them to learn about, and to choose between competing distributive standards –i.e. one which allows for exit. As well as ‘rigging’ the result of his own particular thought experiment by positing that actors behind the veil are risk averse in the extreme, Rawls rules out the possibility of people learning from the experiences of others by specifying that actors behind the veil know themselves to be choosing rules of distribution for a ‘closed society’ where exit occurs only by way of death. The justification for this move follows from Rawls’s assertion that given the option potentially selfish actors may threaten exit in order to exert bargaining power against others to secure ‘unfair’ terms of cooperation. People should, in other words, be thought of as choosing rules of distribution in conditions where their social position might be determined by their enemies. This was always rather an odd move on Rawls’ part since anyone thinking about how to design institutions when they might be assigned a place by their enemies might allow for an exit option precisely so they might escape the possibility of exploitation by opportunistic actors. Even if one were to grant the benefit of doubt to Rawls in this instance, however, it would not be enough to save his theory from the ‘basic fact’ of bounded rationality. On the contrary, in the unlikely event that people do actually agree on a unitary distributive rule such as the difference principle they would have to reintroduce exit options internally in order to have any chance of achieving it. When people must make distributive choices under conditions of limited rationality then it cannot be assumed that knowledge of how to achieve the difference principle or any other ‘patterned principle’ of justice can be ‘given’ to the administrative arm of government. Does redistribution raise the absolute standard of living for the poor? Should redistribution be conditional on behavioural changes and should it be supplied via cash payments or the provision of ‘free’ services such as education? Is a person best placed to help the disadvantaged by starting a new enterprise and employing poorer sections of the population? Would it be best for someone to take a high paying job and contribute part of their income to charity? If charitable activity is indeed an appropriate way to help the disadvantaged should this take the form of monetary contributions or spending time directly with the less well off? Rather than assuming that answers to these questions can be known by any single actor or group, the ‘basic structure of society’ must facilitate the discovery and communication of ‘who should give what to whom’ – i.e. it should allow for people to associate with one another on a range of different terms. In short, without the possibility of exit and the learning opportunities it affords there is no hope of achieving justice understood in Rawlsian terms or anybody else’s. Moreover, in a world where ‘differences’, i.e. ‘inequalities’ in results between individuals and jurisdictions are needed to have any chance of learning what the ‘difference principle’ requires, the observed pattern of distribution at any point in time may be indistinguishable from a scenario in which there was no attempt to institutionalise any particular distributive rule in the first place. 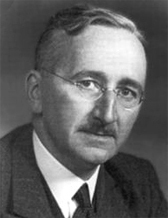 A new article by economists Andrew Farrant and Edward McPhail argues that Hayek was wrong. (I’m working on getting an ungated version). So, is big government a stable equilibrium or, to harken back to what Zhou En-lai supposedly said about the French Revolution, is it “too early to tell”? So far as much of current governmental action is concerned, there is in the present world very little reason for the liberal to wish to preserve things as they are. It would seem to the liberal, indeed, that what is most urgently needed in most parts of the world is a thorough sweeping-way of the obstacles to free growth.